Guys, I kind of feel like I won an all expense paid trip to Disney World over here. And what I mean by “feel like” is that I’m travelling for work this week so yes, technically my expenses are paid. And its like Disney because Charleston is basically the Disney World of pretty old houses and I LOVE me some historic architecture. I’ve basically spent the last few days gawking out the window of my car, trying not to wreck. I’ve walked a bunch, took a personal bike tour with my cousin, eaten a lot, and so forth. Oh, and some work too. So, with my first block of free time, I opted to indulge my love of historic homes. I LOVE historic homes. I love all of ’em, all the centuries and decades equally up until about 1940. 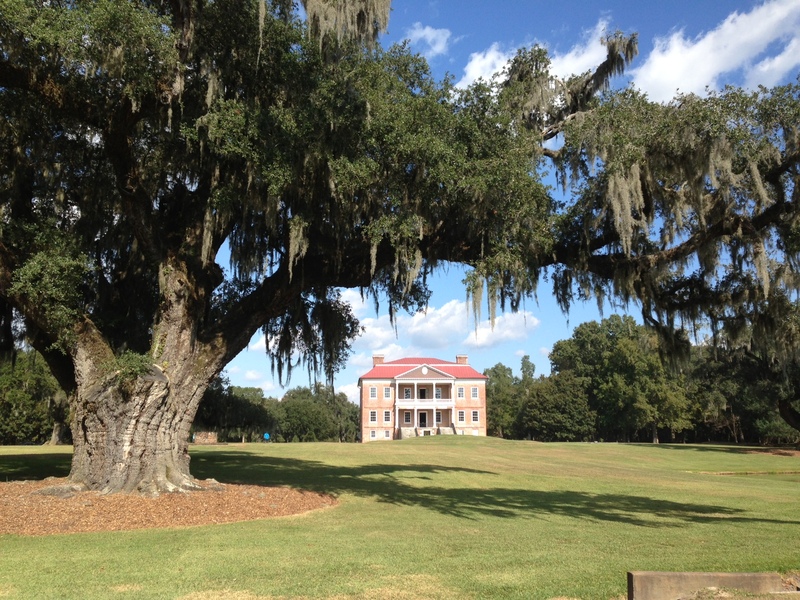 There was a 2-for-1 deal running on couple of plantations on the outskirts of Charleston with my free time this afternoon. 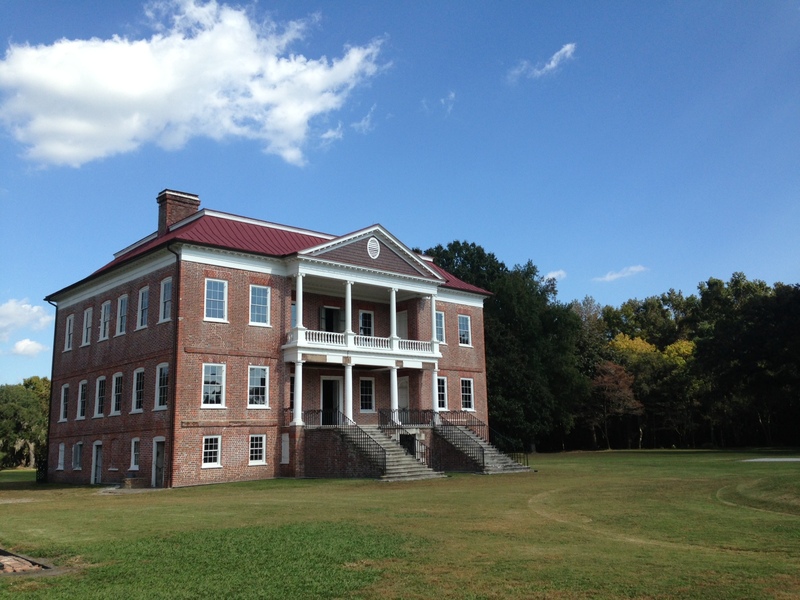 First up was my favorite, Drayton Hall. This home was built in 1742. As in, before the Revolutionary War! 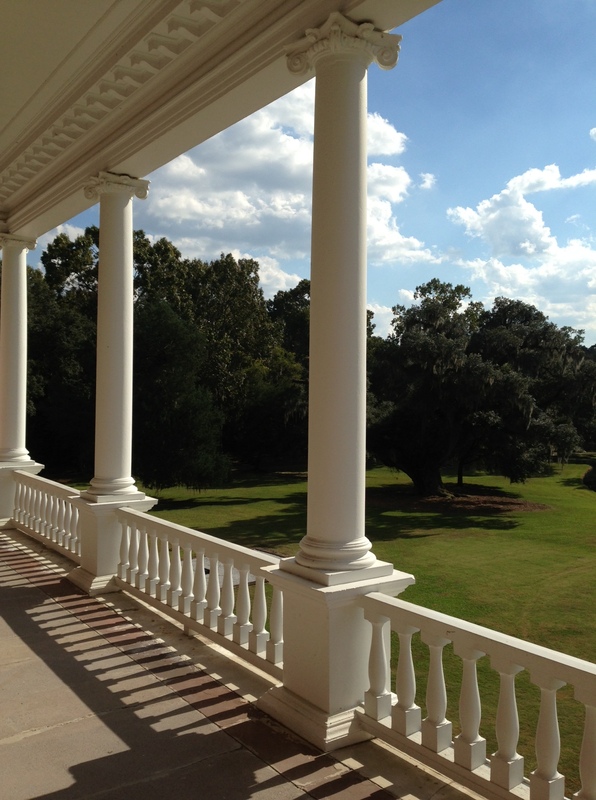 Also this was the only home in the area not leveled during the Civil War. It stayed in the Drayton family for 7 generations up until the 1970s. And miraculously, all seven of those generations opted to basically keep things “as is”, no modernizing, no updating, no re-painting. So, there’s an original plaster ceiling. Original layout, doors, staircases, flooring, fireplaces. No indoor plumbing, no kitchen, no AC, no electricity, no phone line, no telegraph. Most of the interior of the house was painted, for the second time ever, just after the Civil War, to cover some griffiti from squatters when the house was unoccupied. So, that’s some really really old paint. 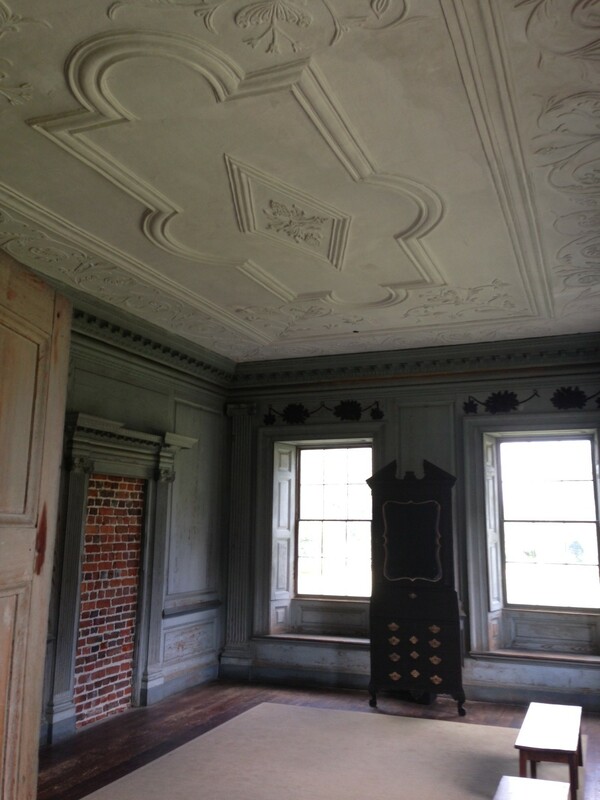 That’s the oldest plaster ceiling in the home, as well as the Civil War paint, and even bricked up door was actually original. Its only purpose was to provide symmetry since there was another door on that wall. Each wall had either two windows or two doors. The door itself disappeared during the Civil War. In the 1970’s the house was sold directly to the National Trust for Historic Preservation, who is now taking care to make sure things stay “as is” and open to the public. One of their next major undertakings is to rehab the 2nd story porch so it can hold up foot traffic again. And that will be just lovely, won’t it? I definitely enjoyed this tour and would highly recommend it if historical authenticity is your thing. I know we’ve had sort of a pumpkin theme going on the blog here lately with Mary-Hall’s “How To Eat Your Jack-O-Lantern series (Part 1 and Part 2) and of course the ever-popular (and recently controversial) Paleo Pumpkin Scone post from last year. But I just had to bring you one more pumpkin related post before letting the topic rest for a bit. 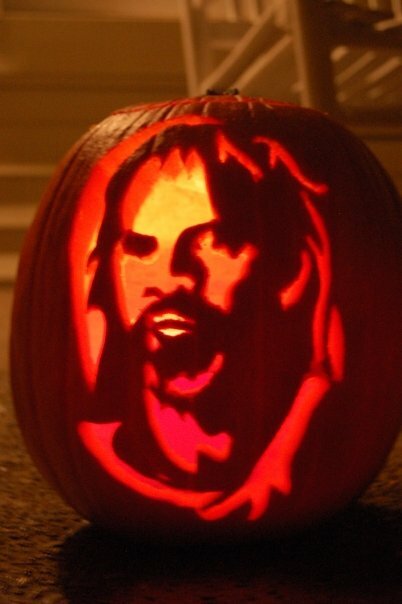 I found out very early on in my relationship with Keith that he was the pumpkin master. The man in known for turning out incredibly artistic pumpkins each year and thus when we became family, he imparted all his pumpkin carving secrets to me and it’s become quite the family tradition now. This past Saturday night we headed over to visit with our friends David and Amanda for their annual “Pumpkin Carv-inival.” We’ve had some fairly epic (in my opinion) pumpkins in the past so we knew we had to bring it this year. Before I show you our creations from this year, lets take a stroll down Bordeaux-Pumpkin memory lane, shall we? 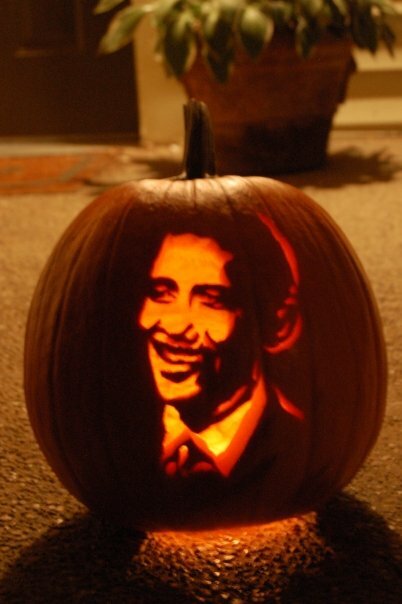 Sadly, 2012 was a pumpkin-less year. So much going on. 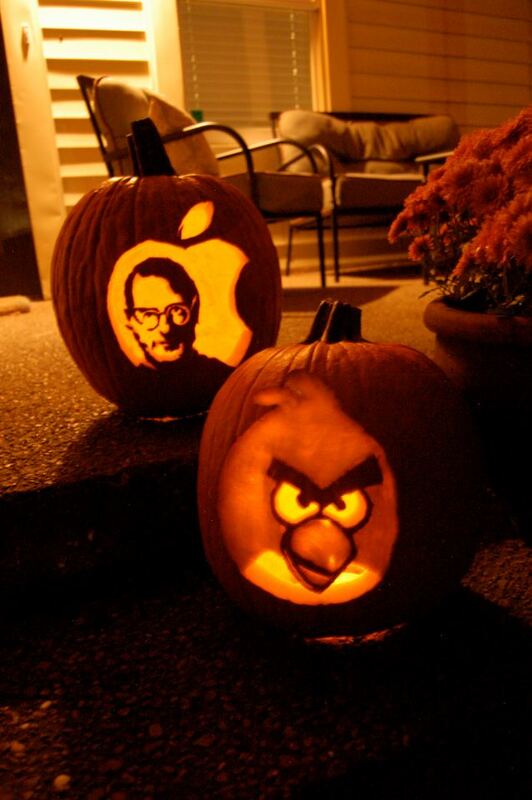 No time to carve the pumpkins. 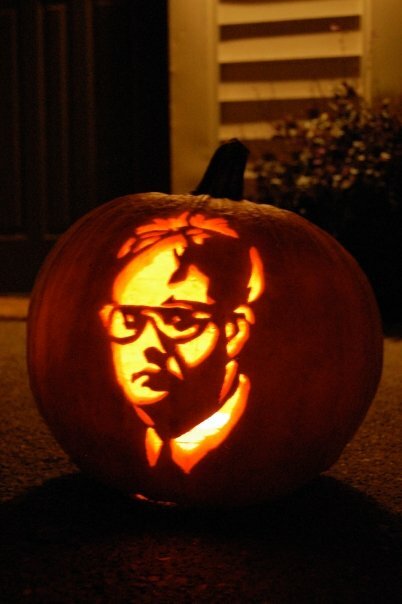 In case you want to get all fancy-town with your pumpkins this year, I’ll leave you with a few tips. 2. 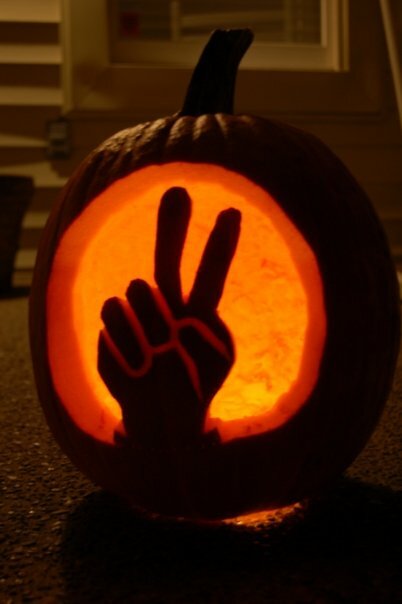 Instead of cutting out the top of the pumpkin to make a lid, cut out the bottom of the pumpkin and throw it away. This way the stem of the pumpkin is the “handle.” Simply light a candle (or place a flashlight or other electric light) on your front step or wherever you choose to display your pumpkin, and then use the stem as a handle to set the pumpkin on top of the light source. So easy. 3. Scoop out as much as you can to make carving simple. Obviously you’ll want to scoop out the seeds and stringy stuff. But if you keep on going and remove some of the meat as well, then it makes carving a whole lot easier since you don’t have as much to cut through. Also, if your pattern calls for shading, making the wall thinner will help the light shine through and show more detail. 4. Make sure you use the tools of the trade. Surprisingly enough, I really love those little $4 pumpkin carving kits you get at the grocery store. We have always had great success with them. They are easier to maneuver than large knives and you’re less likely to get hurt with the mini saw than a meat cleaver anyway. You can also find a step up kit for about $15 and they even make little battery-powered saws (although poor Blake was accused of cheating when he whipped one of those out the other night.) I’ve also heard that tools used in pottery and clay making (Those little wooden and metal-tipped tools) are great for pumpkin carving although I’ve not tried it. 5. Pumpkins don’t last forever. Just like my beloved Pumpkin spice latte from Starbucks, pumpkins don’t stick around forever. At best, you’ll get a few days out of your creation. So. Figure out when to carve your pumpkin depending on when you want it to be displayed. And, take lots of photos of it while it still looks good! 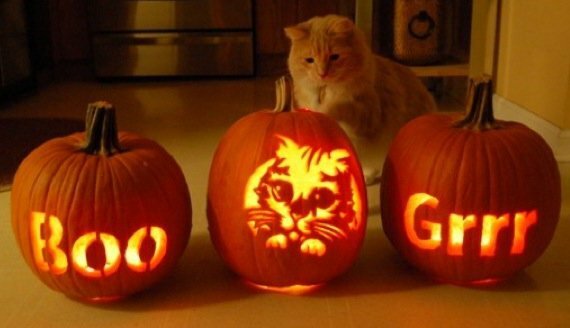 Best wishes in all your pumpkin carving endeavors. I’d love to see what you guys come up with! 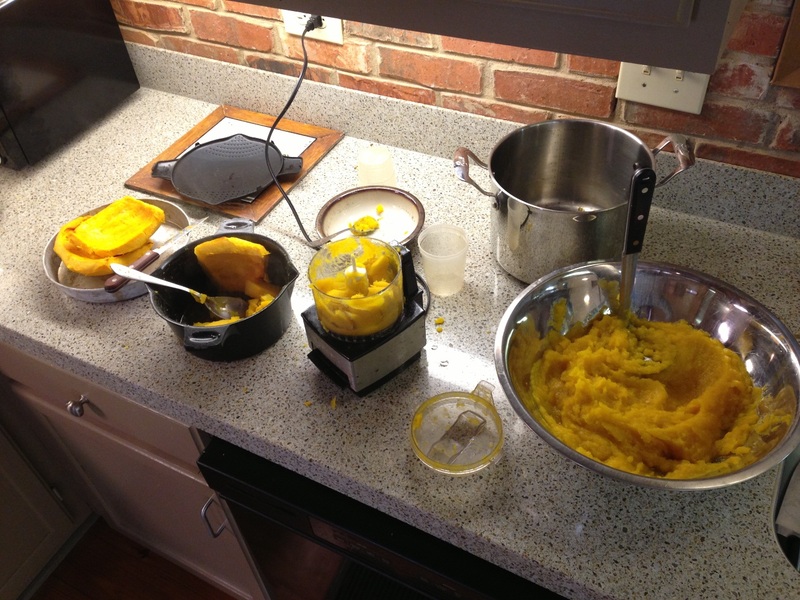 For whatever reason I decided it was high-time I earned my ‘Homemade Pumpkin Puree’ merit badge. And yes, you could do this with your jack-o-lantern provided it doesn’t sit outside for very long or fill up with weird candle soot. 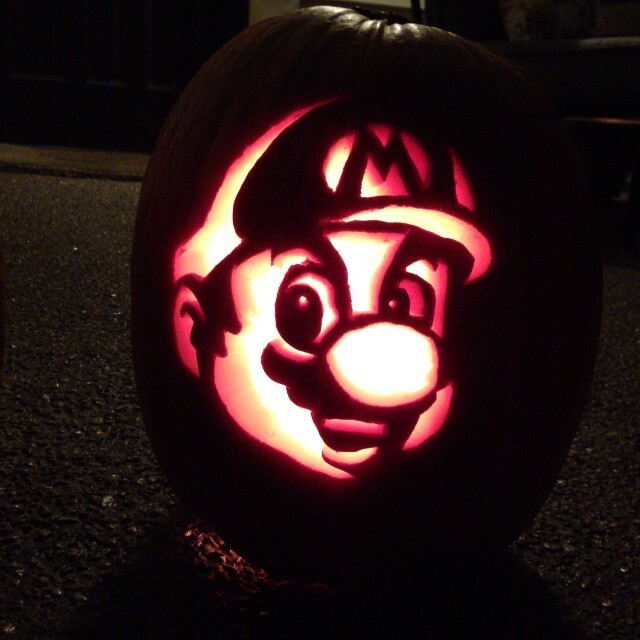 Like maybe if you have a carving contest after which you normally just pitch the pumpkins. NOT after you let it rot on your doorstep for 3 days. Alternately, our jack-o-lantern is getting composted and I made my homemade puree with two of the three small pumpkins that came included with our admission to the local “pumpkin patch”. I should point out – its pretty cheap to buy canned pumpkin. In fact I already bought a can this year, so I know for sure that the price is under $3 for the big size. HOWever, I have heard from two reliable sources that fresh tastes better, and well, doesn’t it always? And I am always down for making food taste better. So, I was all geared up to do a high quality tutorial post for you on my puree-ing adventures, but then I found THE Pioneer Woman’s post titled Homemade Pumpkin Puree and well heck, why clutter up the internet? So if you want to do what I did, start there. Her pictures of food are so lovely and the process is quite simple: cut up pumpkin. de-seed. roast at 350F for 45 minutes. peel. puree. Here are my pumpkins just getting started. I rotated the trays half way through. Except, after one hour my pumpkin still wasn’t that soft, but I pulled it out of the oven anyway. Being past bedtime already, I stuck all that roasted goodness in the fridge to deal with it later. 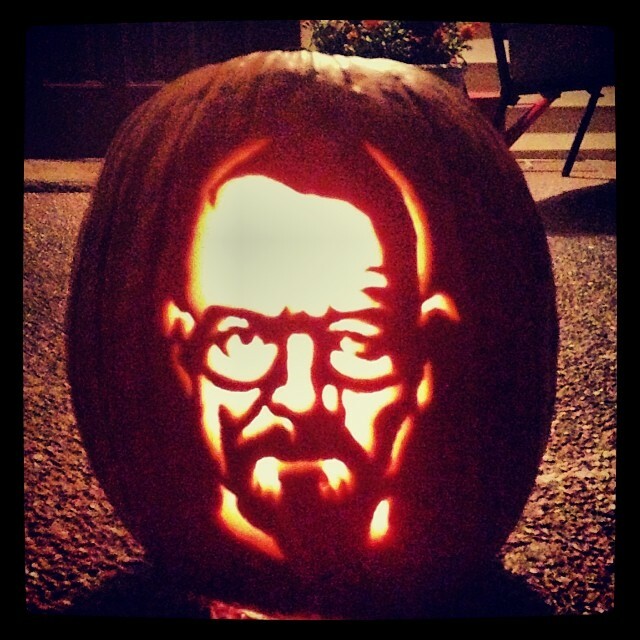 This morning I quickly realized my suspicions were correct – my pumpkin was not cooked enough. The food processor was giving me something the texture of baked potato, while what I wanted was mashed potato. 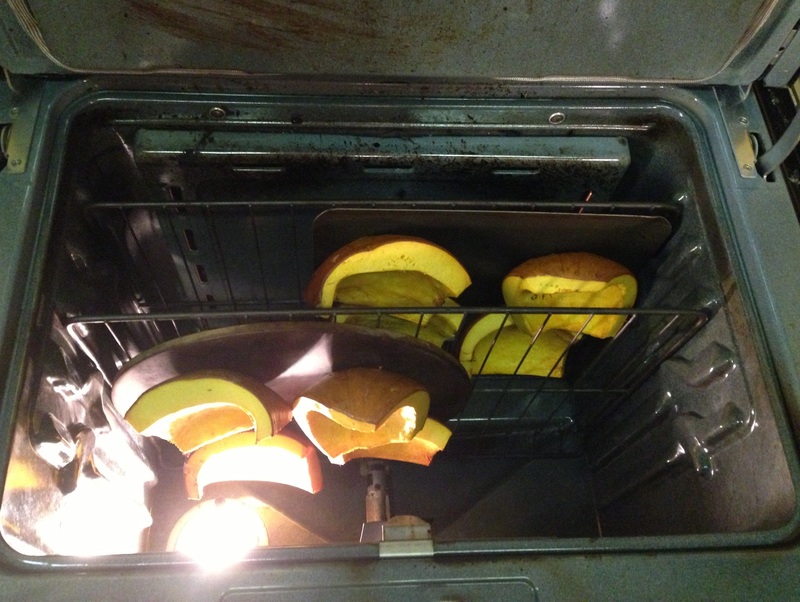 To remedy this, I ran the pumpkin wedges back through the microwave, sprinkled with water, for 5 minutes each. 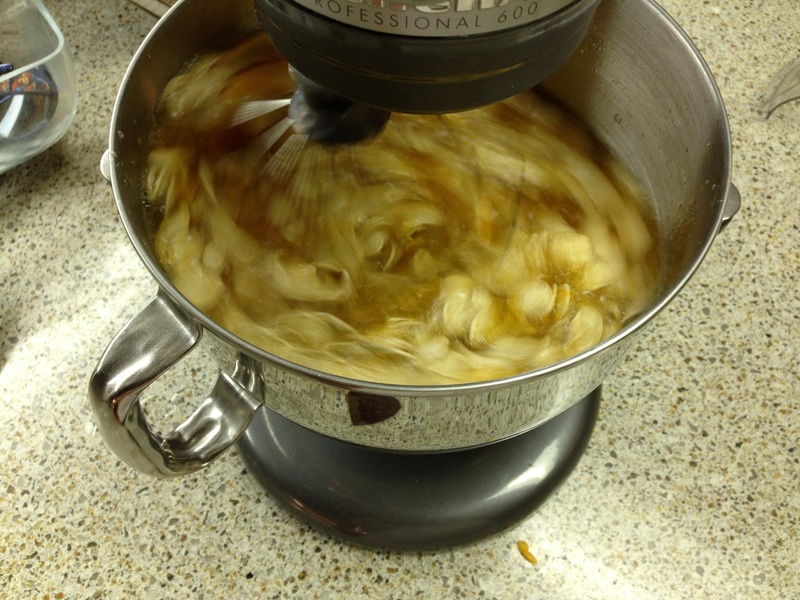 Food processing went more smoothly after that (literally), although I still had to add water to each batch. All in all, none of this was hard but is WAS a little bit of an ordeal. Actually, the fun isn’t even over yet as I have two sections left. Here’s where we’re at, actually. Look at the size of that bowl! Most recipes call for 1 cup of pumpkin puree so we are basically set for life around here. Note that I’m using the world’s cutest tiniest food processor, which has not been helping the situation. And since I have a metric ton of pumpkin puree, what do you suggest??? I get it honest though. 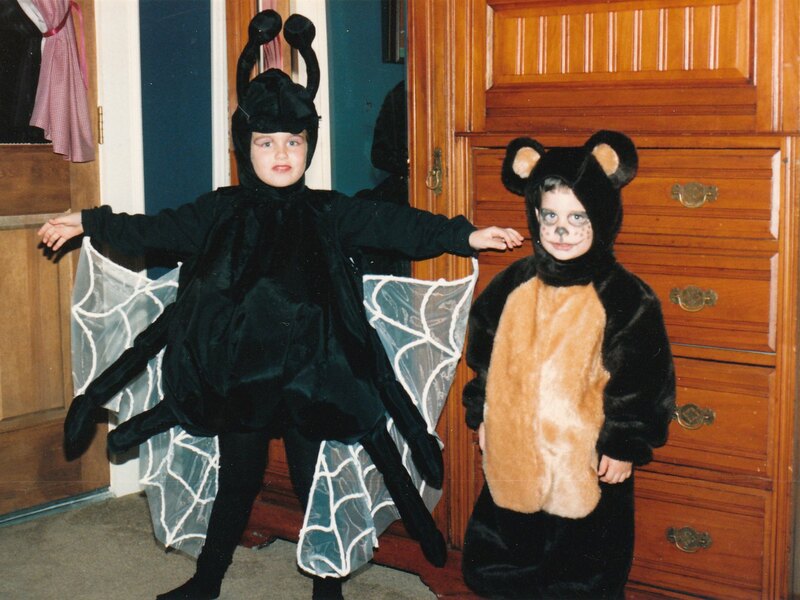 Check out the time I was both Charlotte and her Web back in oh, 1988-ish. 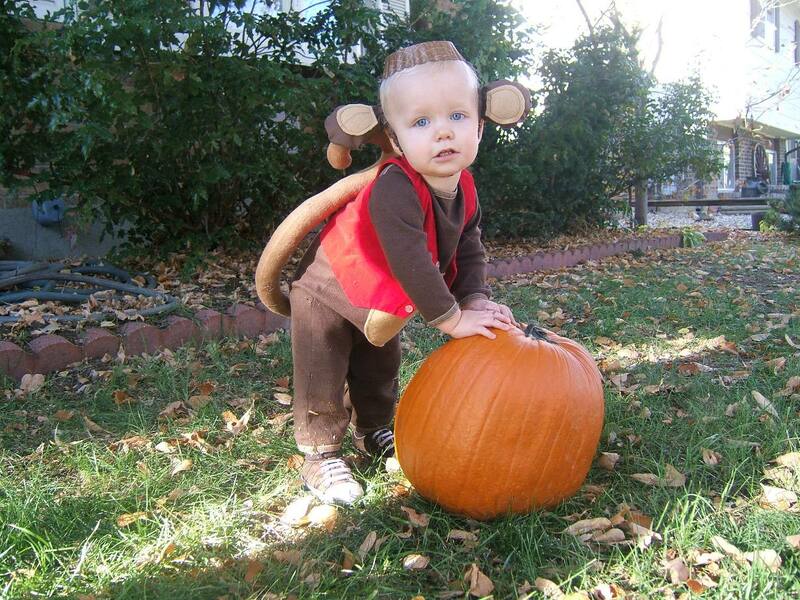 My mom is the champion of homemade costumes, and mine are much less elaborate for sure. But there’s something just plain fun about throwing something together without overthinking it, using stuff that’s been laying around plus some store-bought faux fur, obvs. And also, I totally lucked out this year because Ransom actually requested something really cute all on his own. 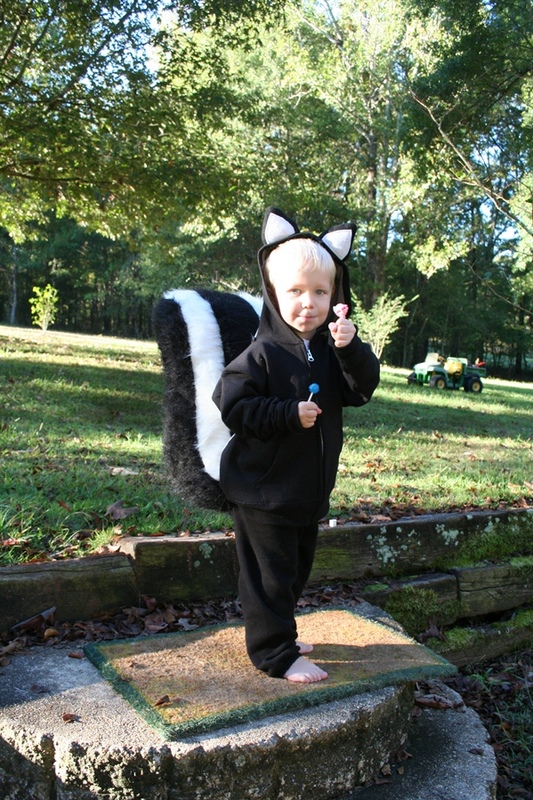 I figured this would be our first year of something commercial ala SpiderMan, Bob the Builder, Elmo but I guess we haven’t connected those dots yet and instead he asked to be a skunk. The kid is really into smells right now. 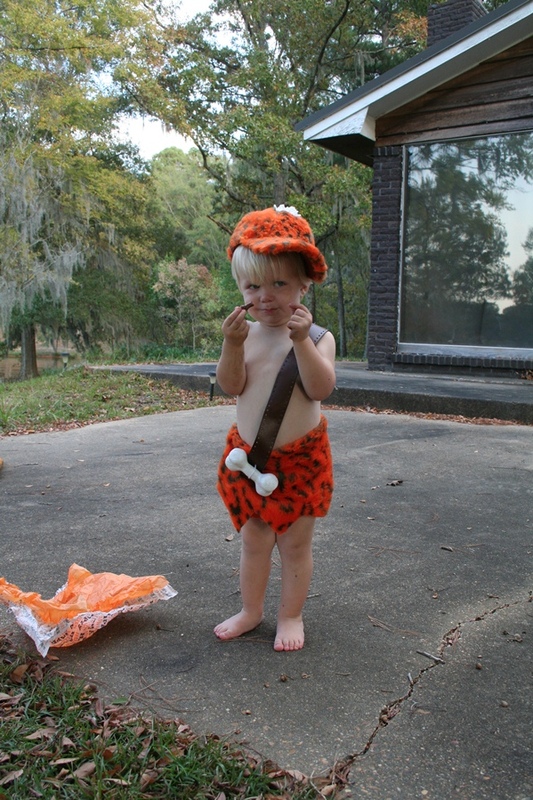 One of his favorite things to do is exclaim loudly in a crowded room or elevator – “Mama! I smell something STINKY”. Sometimes he does smell something stinky, ahem. I usually respond with “I bet its a stinky skunk” which sends him into fits of laughter. And then we also frequently call him a skunk as a term of endearment aka “Come here you little skunk” when he’s being, well, skunky. Nothing here is critical, dimension-wise. Just go with it! I drew out patterns on kraft paper, and then just cut out leaving an extra 1/2″ or so for seam allowance. Flipping the patterns over is the easiest way to make things symmetrical. Sew all the tail sections with right sides together. Flip inside out and then stuff with…. packing peanuts! Fiberfill was too heavy and unwieldy for Ransom and his sweatsuit. Then sew the base of the tail to the booty of the sweatpants. Finally, add an 8″ section of black thread or fishing line to each side of the tail at approximately shoulder level to form some supports. 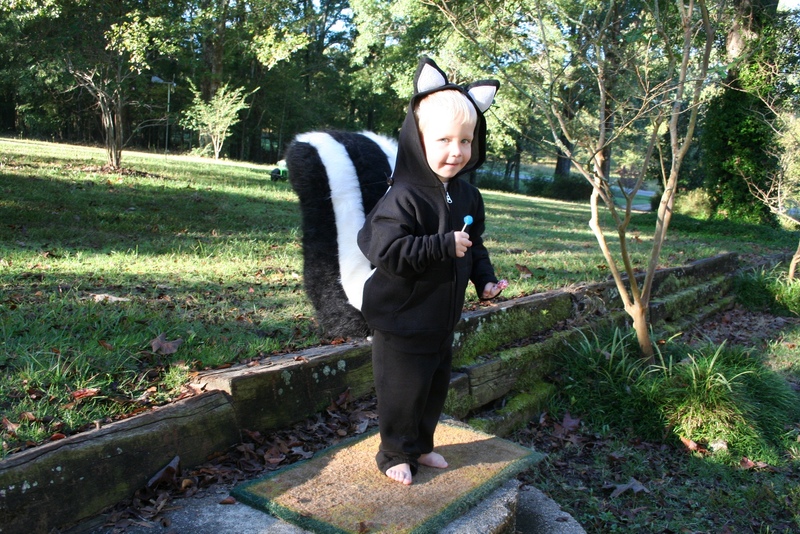 For the sweat shirt, just cut out white felt stripes and sew them down with your sewing machine. My cheapo machine hated this for some reason, and there are tension issues galore inside the sweatshirt, but who cares? For the ears, just cut out two pairs of black triangles and make tiny triangle shaped pillows with fiberfill. Stitch these on the hood wherever looks the most “realistic”. Ha. 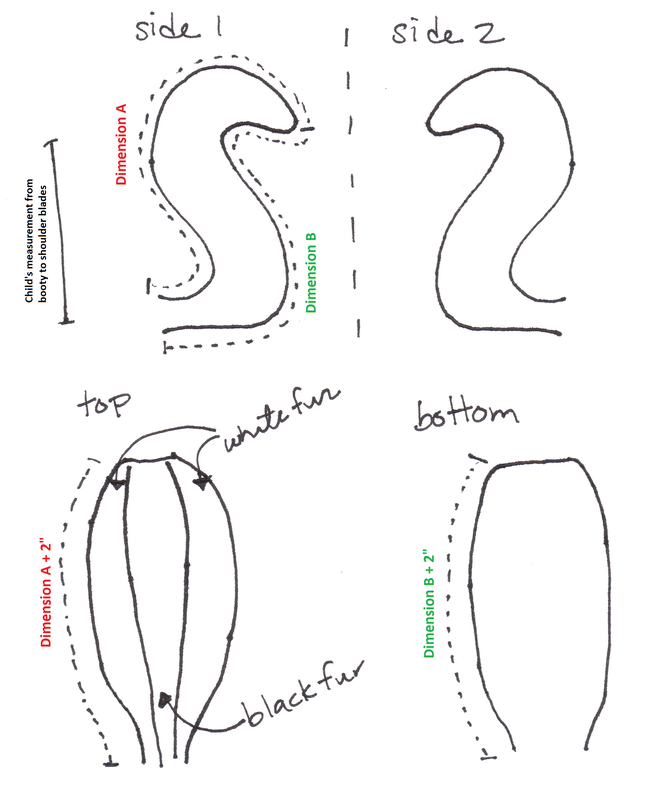 And finally, sew a couple of buttons right where the collar seam and the shoulder seams of the sweatshirt intersect. 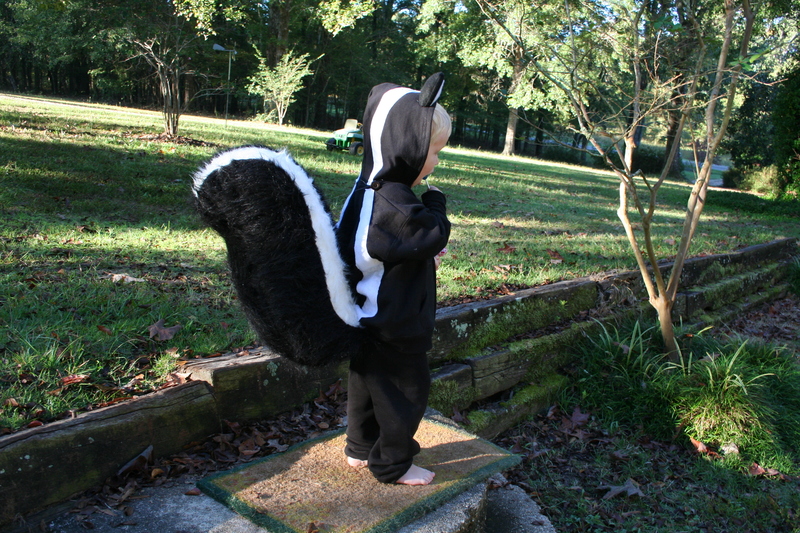 Then you can put loops in the fishing line anchors to hold that stinky skunk tail up just like Pepe Le Pew. You can see the buttons in this pic but ya can’t see the fishing line, hooray. And that’s it. You could easily modify this to be a fox, cat, racoon, and so forth. I was *this* close to seeing if Ransom would rather be a more culturally relevant fox. I resisted. But YOU could find a brown or red sweatsuit (or dye one), modify the tail pattern to be just red with maybe a white tip, and then train your child to make jibberish noises when asked “What does the Fox say?” And then y’all will be the coolest on the planet. Seriously, go sew something with faux fur. Its unbelievably satisfying. Winter is for the Birds…. Sunday I had a rare weekend-day-off-at-home and since the weather in Nashville has started to turn a tad bit chilly, Keith and I decided to tackle a project that we’ve known was coming: “winterize” the chicken coop. While our chickens are all breeds that are fairly heat and cold hardy alike, we still want to make sure that our girls stay warm, healthy and cozy during the cold months ahead. 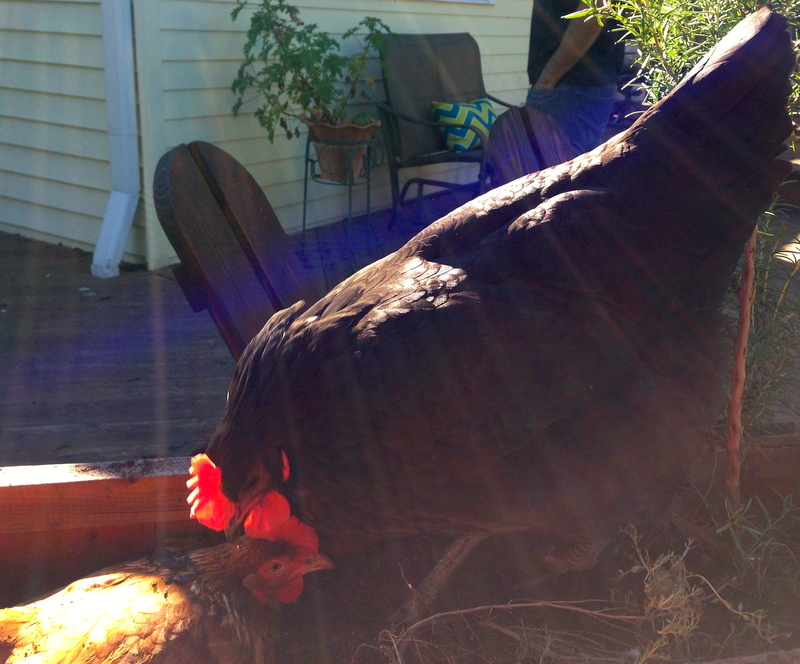 I’ve read a few articles on “winterizing” in various chicken magazines and books, and Keith found this excellent four-part series on The Garden Coop blog to peruse. We knew that there were a few things we would need to do to get our girls the type of winter retreat they would need. 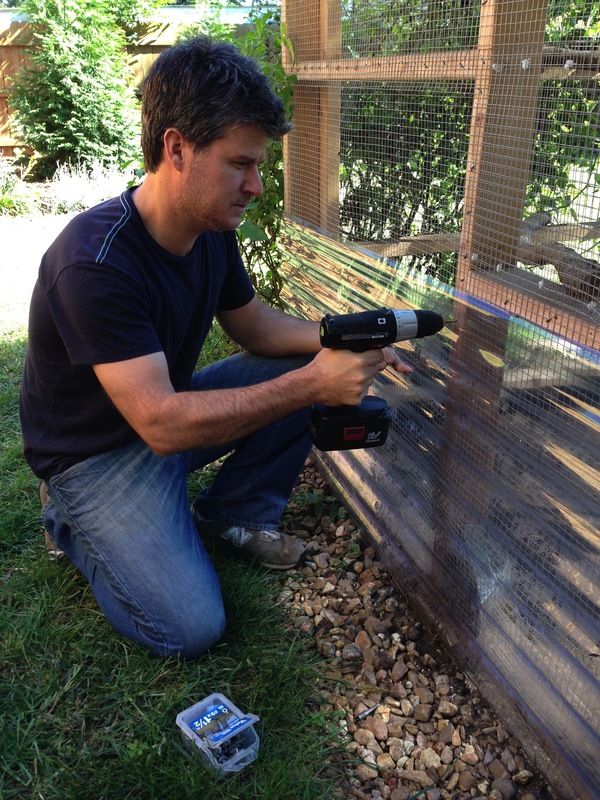 First of all, we needed to re-install the plexiglass windows in the henhouse wall. We’d removed the “panes” of these windows during the summer when the temperatures were rising and we were afraid we’d end up with fried chicken if we didn’t provide some ventilation options. That was a pretty simple process as all I had to do was get out our cordless drill and screw the plexiglass back into place. I also did a “deep clean” and scooped out all the chicken poop on the ground (I typically do this about every 4 days anyway) and thoroughly scrubbed out both the water-er and the feeder. The tomato plant that had been in the little garden space on the right hand side of the coop had about run it’s course, so I took the time to pull that out as well. I’m not quite sure what I’ll do with that garden area now….the girls seems to like to dig up anything I plant so I’m thinking some sort of more permanent solution is in store….although the tomato plant sure thrived, so who knows. The big ticket item that we wanted to take care of was adding some sort of outer wrapping to the coop to help provide insulation and also keep things nice and dry. We’ve had some minor issues with rainwater splashing into the back half of the run and we didn’t want our feathered friends getting wet and cold…or worse…moldy and cold. There are many ways to do this…I’ve seen everything from landscaping fabric and canvas to plexiglass suggested. One guy even ordered custom-made tarps that he’ll be able to use every year. We strongly considered the wrap-the-coop-in-plastic approach suggested here, but then after a trip to the Home Depot, decided to go for clear plastic sheets like we’d used on the roof. It seemed like a durable way to effectively keep the water out and block chilly breezes, and all the while the girls can still enjoy the view. 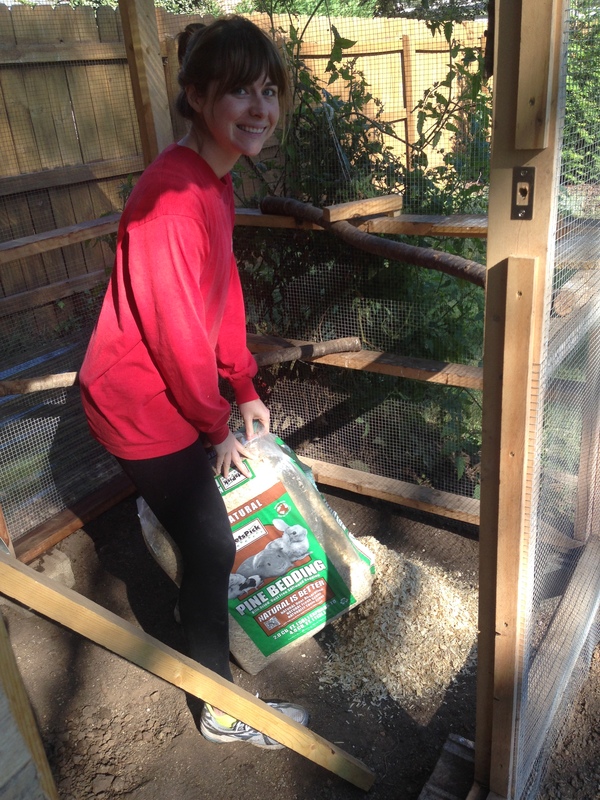 Speaking of the view…we also added a mirror in the henhouse. 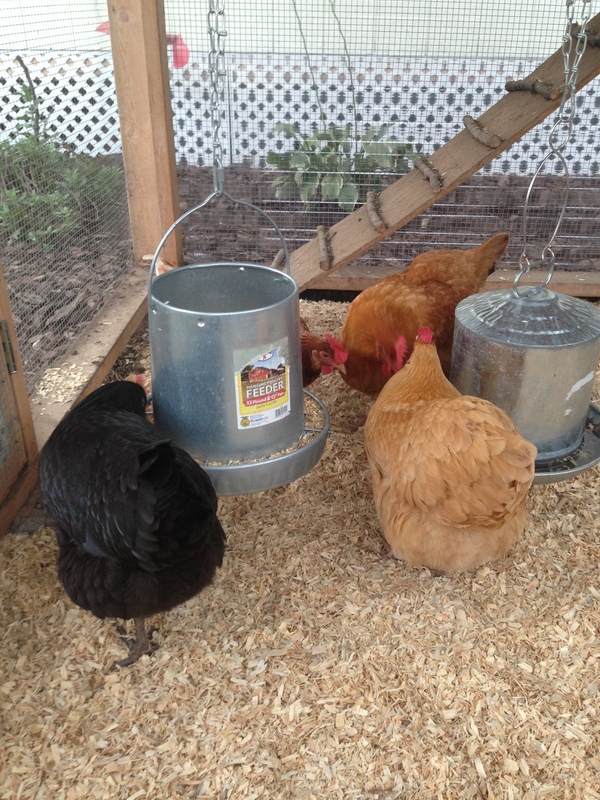 We’ve heard that chickens love checking themselves out so we’ll see if our girls enjoy it. Keith secures the new “siding” to the back of the run. Excited that it looks nice and hopefully will do a good job of keeping our ladies warm and dry! 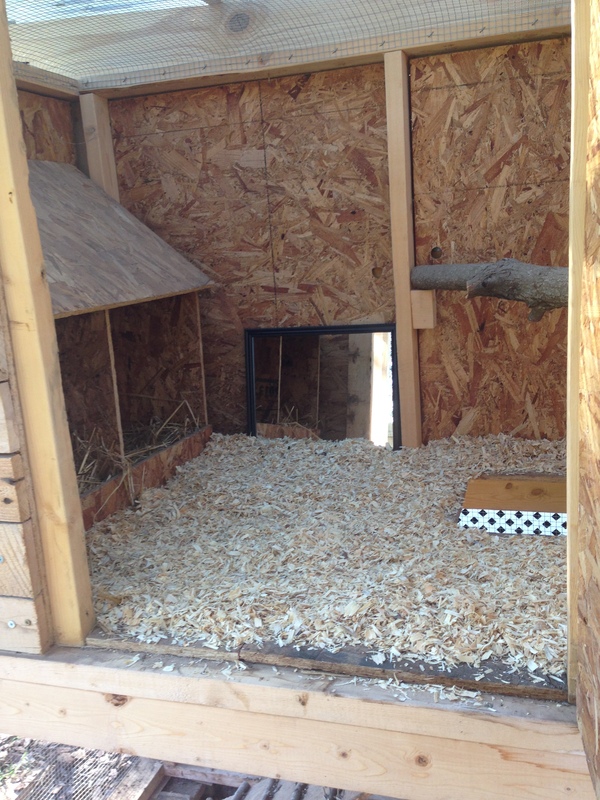 We also put a thick layer of pine shavings down as bedding to provide insulation from the cold ground and a cozy place to curl up and will be adding a quilt over part of the hen house (there is a vented ceiling) for additional warmth. They key is to keep it warm while still providing adequate ventilation. Working hard. Pine shavings are messy business! We may have to make other tweaks along the way as the weather continues to get colder, for example, the waterer that we have is metal and we don’t want the girls to find a giant ice cube one morning in their water bucket. But we’ll take those in stride and learn along the way. 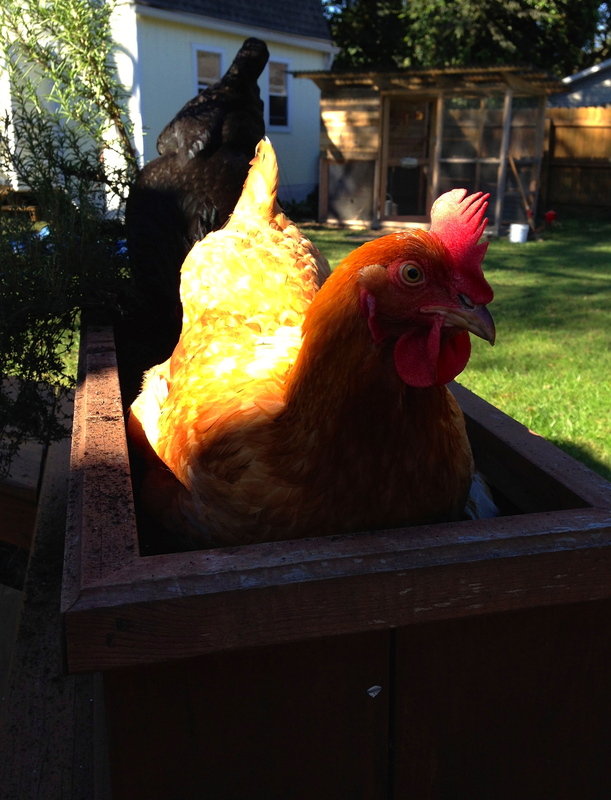 The other big change we made was turning what used to be my herb/jalapeno planter box into an official dirt bath for the girls. For a few weeks now they’ve been climbing in and making themselves at home. First they killed one jalapeno plant. Then the other one. Then my Rosemary bit the dust. So today I yanked out the remaining Thyme and moved the whole kit-and-caboodle into the coop so they can frolic about in it all they want. I’ll leave you with some photos of the girls and their new digs to enjoy. Aren’t they so large and lovely now? It’s crazy to think that they were just little chicks not too long ago. Jane all cozy in the dirt bath herb garden. Secrets don’t make friends, but hens make secrets. Lousia (Left) and Sylvia (Right) chat it up during a good dirt bath. Snacktime! 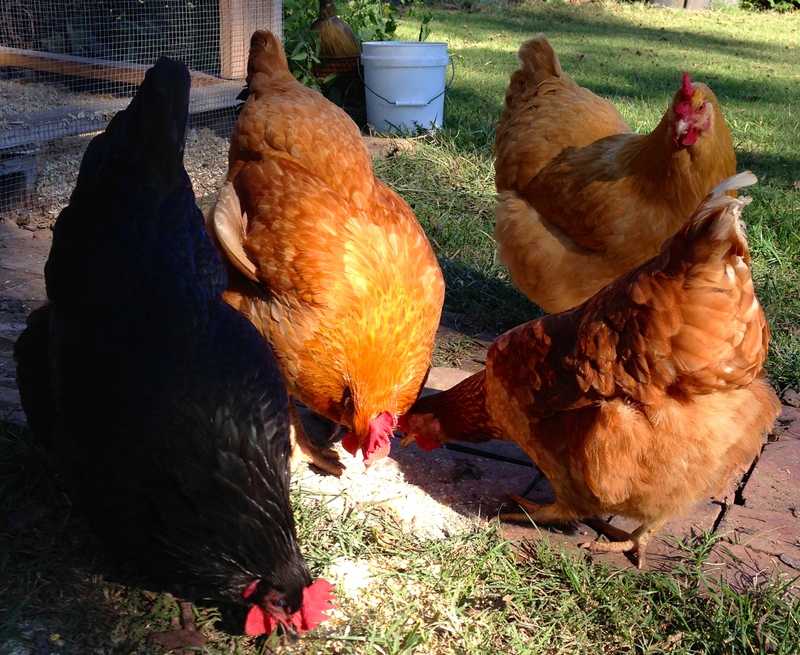 The girls chow down on some food I spilled during clean-up time. Such pretty girls. Today is like the first day of fall here in Mississippi. Hooray! The air was brisk for once so its high time we discuss something fall-related around here. 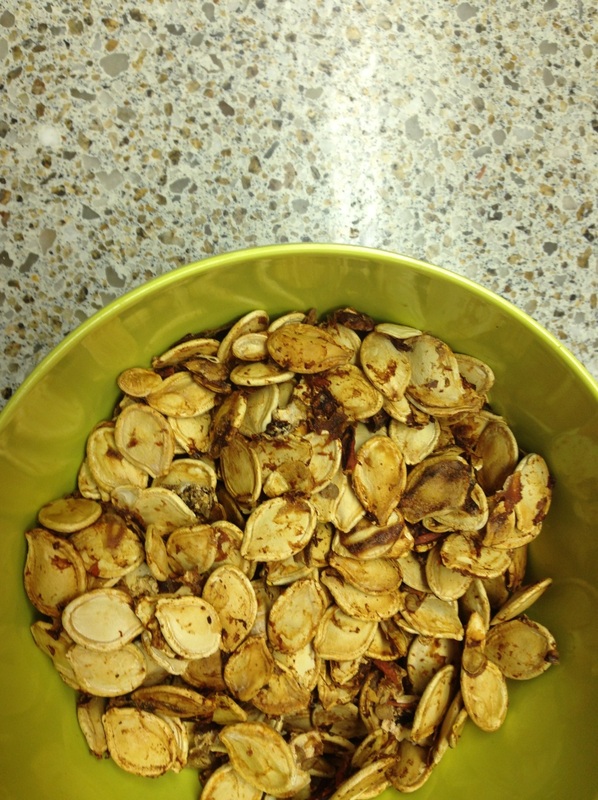 This will be a two part series but this first post is about toasting pumpkin seeds. Anybody carving a jack-o-lantern this year will have that familiar pile of slop and seeds to deal with, so I’m figuring you might as well eat some of it, right? Waste not, and such. Here is my pile of slop from our first pumpkin of the season. I’ve done this a time or two with mixed results. Picking those seeds out is kind of a lot of work for something that’s only kind of good. Well this year I’ve at least solved the puzzle of the “work” part. 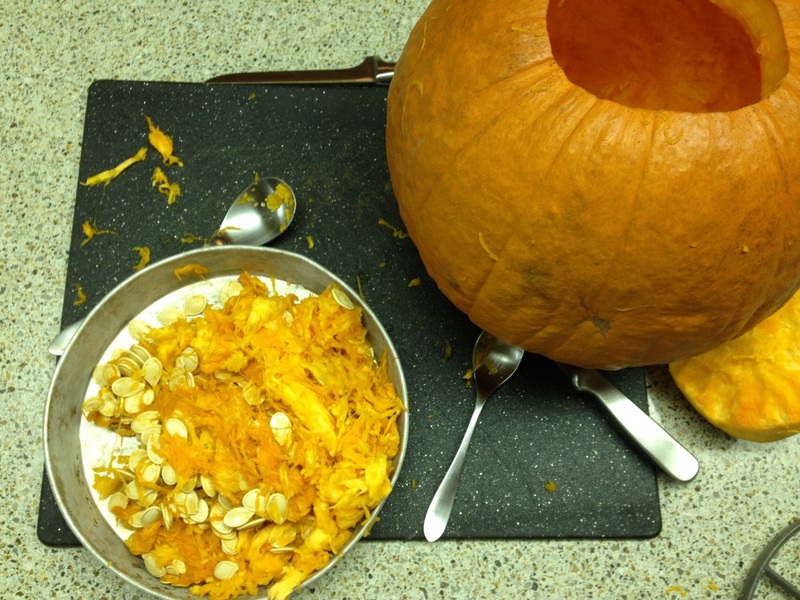 Here is the easy way to separate those seeds from the rest of the pumpkin pulp. Two, add water – as much water as you can safely add without it sloshing out. Three, turn on the mixer and let ‘er go for a few minutes. When you come back, the seeds will be at the top and all the pumpkin stuff will be at the bottom. Strain the seeds out with a slotted spoon or something and let them dry on a cookie sheet. So easy. Then you’re ready to toast! I mixed my seeds with: 1 egg white, 1 tsp chopped chipotle pepper, 1tsp sea salt. I toasted at 375F for about 20 minutes, stirring occasionally. And the result was: SUPER AWESOME!!!!! No not really. The resulting product was okay. I’d certainly eat them while stuck on a deserted island but they’re nothin’ to write home to mama about. Ransom likes sucking on them. Its really cute… and by cute I mean gross. The chipotle is a little overpowering and weird. If I do this again, I think I’ll stick to plain salt. And, I should also point out, if you were on say, the Paleo diet, then heck this is probably as close to popcorn as you are ever gonna get. So eat up Paleo friends! I however am more likely to just go pop some actual popcorn than eat those seeds up there. So in summary, how to eat the seeds out of your jack-o-lantern? Use your mixer to separate out your seeds and then google up a tasty recipe for them because I wouldn’t necessarily recommend mine. Wishing you all a lovely brisk fall weekend! Let’s go ahead and deem this ‘secret project reveal’ week. 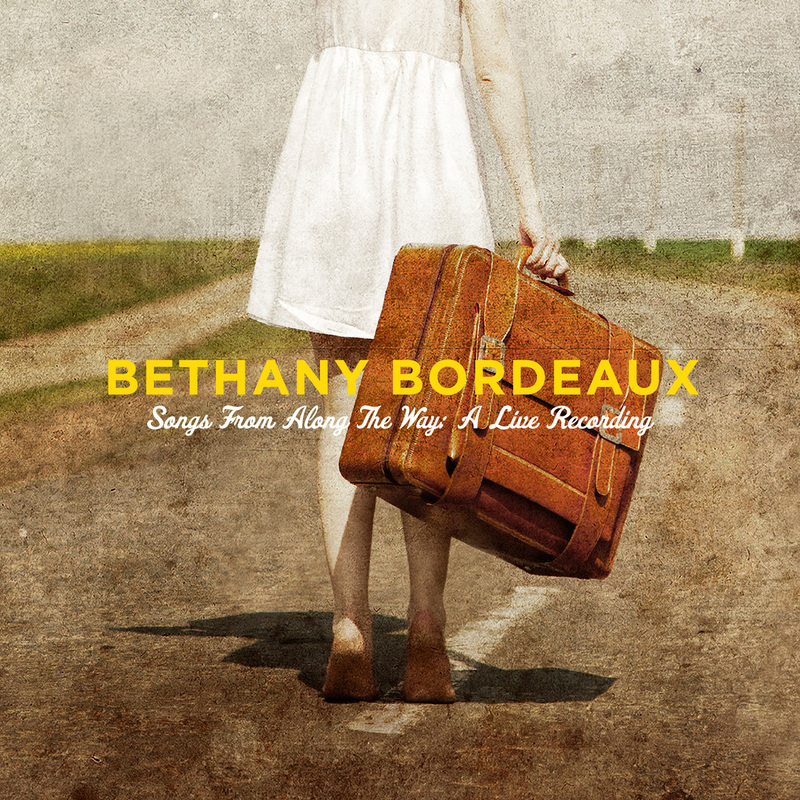 Bethany is releasing a CD and I am, not to be outdone,…. Moving to Fiji! Actually I’m 15 weeks already although reality has NOT yet set in. We are fairly comfortable in our one child/no diapers/no crib routine and I can’t even fathom how much things are going to change. In 5 more weeks, we’ll find out the gender and maybe at that point we’ll start working on names and a nursery and perhaps things will all shift into reality for us. Lord help us in the name department if its another boy. We fairly well exhausted our ‘boy names’ list with Ransom. There were a few weeks when me and two out of my three sisters-in-law were all simultaneously pregnant so it is definitely “Baby Season” in our family. (And the third has a 10mo old.) Luckily, Ransom LOVES babies. 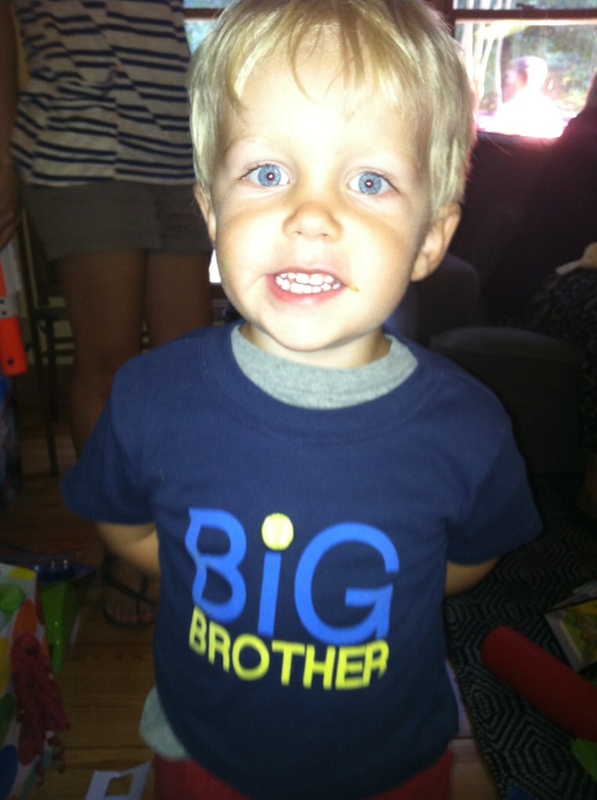 I am the most excited right now about getting to watch him be a big brother, because I know he’s going to be awesome at it. You should hear him talk to his baby cousins when he’s holding them. He talks in a soft high voice and sings little songs to them, its the cutest thing ever. And then he tries to squeeze them in two.. The first trimester was fairly smooth for me with little to no nausea (lucky I know). There were about 4 weeks of complete exhaustion, (don’t remember that from Pregnancy #1…), but that’s thankfully over now. For a while there, I could’ve closed my eyes and gone to sleep at any point in the day. My sense of smell is working in overdrive. And at this point I can only wear about 5% of my wardrobe even though I don’t really look pregnant yet. 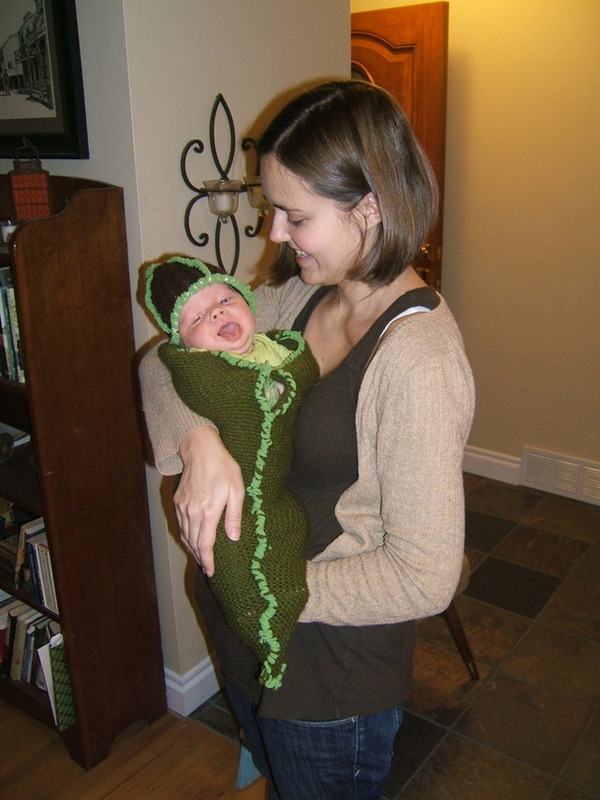 Just, bigger – a less-than-fun aspect of early pregnancy. Alas. So, look forward to some occasional baby related programming as the projects come and go – DIY crib skirts and homemade baby food and whatnot. Hooray!